Imagine you are diagnosed with diabetes. Due to the burdens placed on them, your family turns you out of the house, you lose your job and friends and eventually end up homeless. One day someone sees you acting strangely on the street, perhaps you have low blood sugar, and calls the police. You are arrested and end up in the correctional system. While incarcerated you receive care, but budgets are tight and personnel are not adequately trained. Consequently you are not prepared for a life outside of prison and you end up repeating the cycle that got you there in the first place. This may sound preposterous, but it happens to people with mental illnesses every day. 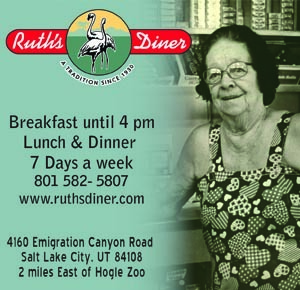 In 1987 three Salt Lake City moms wanted to find a place for their three adult children, with mental illnesses, to go during the day. They traveled to New York and toured the Clubhouse International facility there. The three moms were impressed with what they saw in New York. Jan Nelson, one of the three, told her husband they needed to move to New York. He had a better idea and together Norm and Jan Nelson started Alliance House using the Clubhouse model. They converted, remodelled and expanded an old firehouse on 1724 South Main Street. Over the years housing has also been added close by. Leif Oldert is the executive director of Alliance House. He is a passionate about the work there and says, “Rather than focus on clinical and medical barriers we focus on strengths and skills.” In order to do that the Monday through Friday environment at Alliance House is structured around a regular 9 to 5 work day. Each morning begins with an orientation meeting for staff and members where the jobs available for the day are presented. The jobs available at Alliance each day include accounting and data entry for the business unit, preparing breakfast and lunch in the culinary unit’s full kitchen or career development with employment and educational programs. All jobs are voluntary and members are invited participate by learning critical job skills. 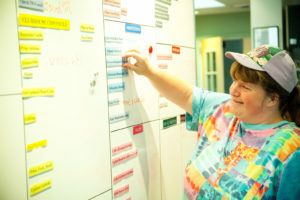 The ultimate goal according to Oldert, “Is to refine and gain skills to prepare members to return to outside work.” So once they feel ready members move on to transitional employment with one of the businesses partnering with Alliance House. Transitional employment can last from 6 to 9 months then a member teams up with a staff person to learn a new job together. The benefit for employers at this stage is that if for any reason a member can’t make it to a workshift, someone from the staff will fill in for them. The employers are guaranteed shifts are always covered. 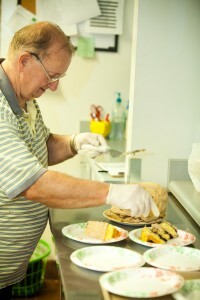 Once the member feels confident in their abilities they can move from transitional employment to supportive employment. During the supportive phase they still get support from Alliance staff including mediation for any problems that may arise, but absentees are no longer guaranteed. The final step is independent employment and self-sufficiency. 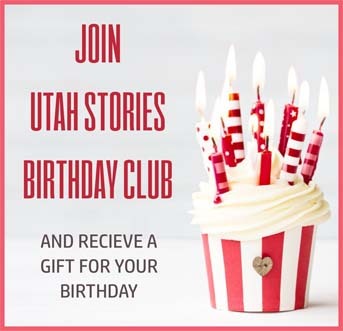 Some of the employment partners working with Alliance are the University of Utah, Horizonte, Salt Lake City Youth Services, T.J. Maxx, Ballard Spahr LLP, Wasatch Brewery and Squatters Brewery. Michael Grant is one of the members currently participating at Alliance House. He’s been a member since November, 2010. Since being there he’s earned his GED and is currently in transitional employment. He says, “My life changed after I came to Alliance House. It turned on a light bulb in my head.” Michael realized he could gain skills and find productive employment. Oldert explains that the approach is holistic – it’s about the entire being. “Everyone has different needs and different paths to recovery.” Alliance provides the fundamentals with work, training and relationships. They also offer housing. The apartments, in close proximity to the main center, provide a safe place to live for those with no where else to go. 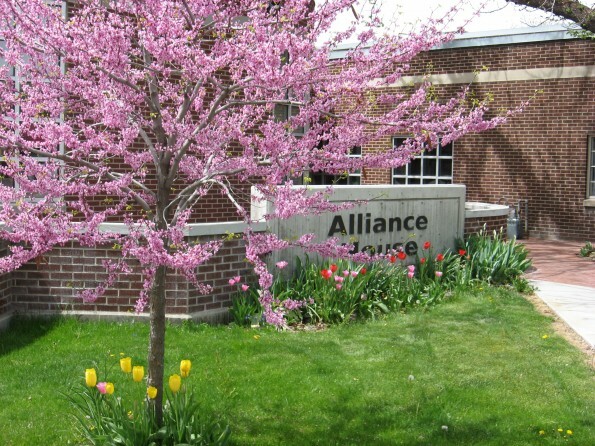 No one is turned away from the programs at Alliance House and for those without ability to pay or with no insurance, the cost is covered through fundraisers and donations.